More than two decades ago, a group of Filipino engineers and roofing business practitioners saw an opportunity to fulfill the urgent need for shelter in the country and banded together to form a team. 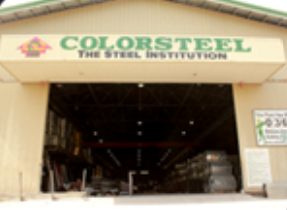 With a combined potent synergy of intellect and passion, they created COLORSTEEL. Committed to provide a dependable roof for every home and business, COLORSTEEL has been producing high quality pre-painted long span roofing, framing, decking and cladding products and services. Whether it be for residential, commercial and industrial application, COLORSTEEL provides the most practical solution for different roofing needs that enables and empowers you to enjoy the present and to prepare for whatever tomorrow brings. 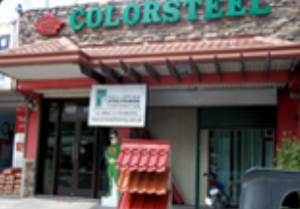 Colorsteel will be known as the steel institution of quality and affordable complete roof systems and decking products and services available all over the Philippines. To rollform excellent profiles of roofing, framing, cladding, and decking products at a very competitive price using the highest quality standards of raw materials. To seek customer satisfaction by providing outstanding services in the delivery and installation of all company products. We are primarily concerned with the welfare and progress of our customers, suppliers, employees, and stockholders. We strive for excellence and leadership in the industry. We strive to become one of the best-run companies in the Philippines. We contribute to the well-being of our brothers and sisters in the community. We offer the fruits of our labor to God, to our family, and to our country. Committed to provide a dependable roof for every home and business, Colorsteel has been producing high quality prepainted long span roofing, framing, decking, and cladding products and services for more than two (2) decades since its establishment in 1994. In its 20th year, the deeper challenge of establishing itself as "The Steel Institution. ABOVE ALL." continues along with the task of fulfilling its commitment to its customers, suppliers, employees, and stockholders. Guided by its 5-Pillar Commitment, Colorsteel continuously fuels itself with youthful determination and a relentless passion to provide quality and affordable roofing and framing systems all over the country. steel roofing and roof engineering services. It started its operations in January 1995 with its base located in Makati City. 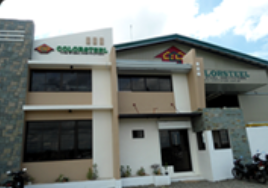 In anticipation of the vast growth in Central Luzon, Colorsteel established its first sales office in San Fernando Pampanga on June 19,1995. To solidify its presence in the roofing industry, Colorsteel implemented its strategic plan to enter into rollforming operations of its own. It established its rollforming plant in San Fernando, Pampanga in March 2000. Inspired by its accomplishments for the past 10 years, Colorsteel embarked in expanding its coverage. It established warehousing operations in Lipa, Iloilo, Davao, and La Union as well as sales offices in Urdaneta City and Cavite. 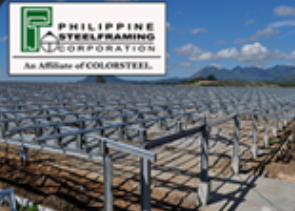 Philippine Steelframing Corporation was organized on November 18, 2006 as an affiliate company to focus in the fabrication of quality and guaranteed galvanized framing systems. It was in 2008 when Colorsteel started its rollforming operations in Iloilo to further improve its presence in Panay and Negros areas. Colorsteel began to establish its business relation with world class foreign suppliers of prepainted and galvanized coils. During the end of this period, Colorsteel managed to import almost 100% of its raw materials. 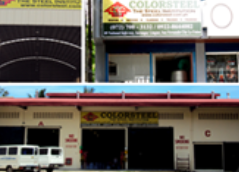 On October 08, 2013, Colorsteel Cebu Rollforming Plant was officially opened with complete product lines. It will likewise serve as the company’s hub for Visayas and Mindanao operations. Bohol and Tacloban sales offices were subsequently established. 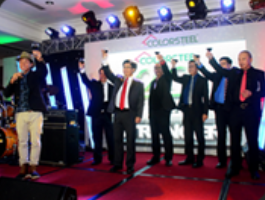 Colorsteel marked another milestone as it reached its 20th founding anniversary on December 16, 2014. Colorsteel has become one of the fastest growing major players in the roofing industry through the unwavering support of its industry partners. 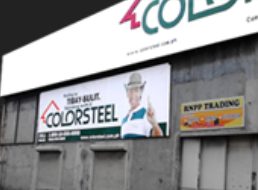 Colorsteel now operates 31 sales branches and 7 rollforming plants nationwide as it pursues its vision of bringing its products to the entire Philippines. The company continuously grows as a professional organization and as a major player in the roofing industry.